It can be hard, creating colors that can be recreated consistently, working up large orders, coming up with original and compelling inspirations – that can be difficult. 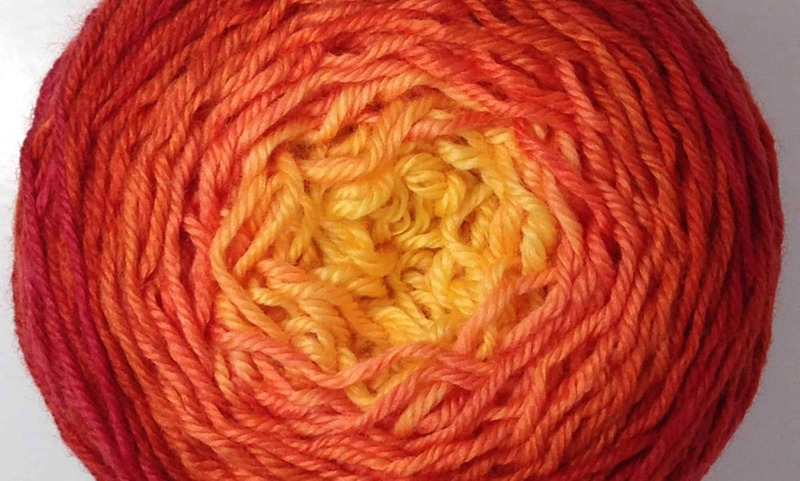 But, overall, it’s a blast, and I feel grateful to every customer we have who allows me to continue to dye beautiful yarn! 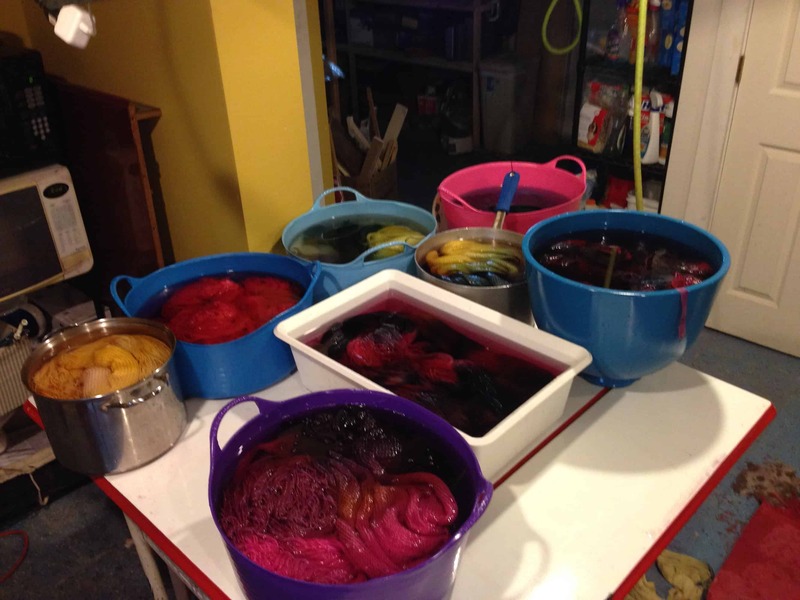 I love dyeing rich and varied colorways, they’re so gratifying! But sometimes I forget that, as a knitter, I REALLY enjoy working with semi-solids! There’s something peaceful and compelling about working with a nice solid, one with subtle variations and some give-and-take in the depth of hue, that makes me very happy. We have various semi-solids in our stable of colors, and we’ve added a few more. I’ve been dyeing up large amounts of these to fill orders, and also to take with us on our Spring/Summer Fiber Shows. 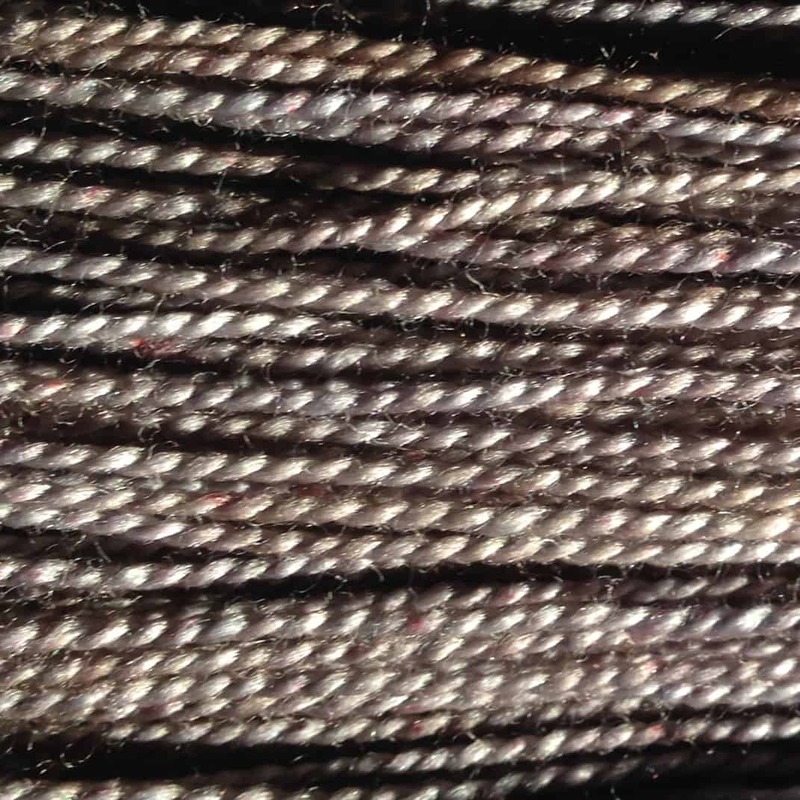 Some of our newest semi-solids are shades of grey; Pewter & Platinum. Joining them as a gradient FLOW colorway is Granite, not specifically a semi-solid, but rather subdued as FLOW colors go! Another great semi-solid addition is Sapphire. 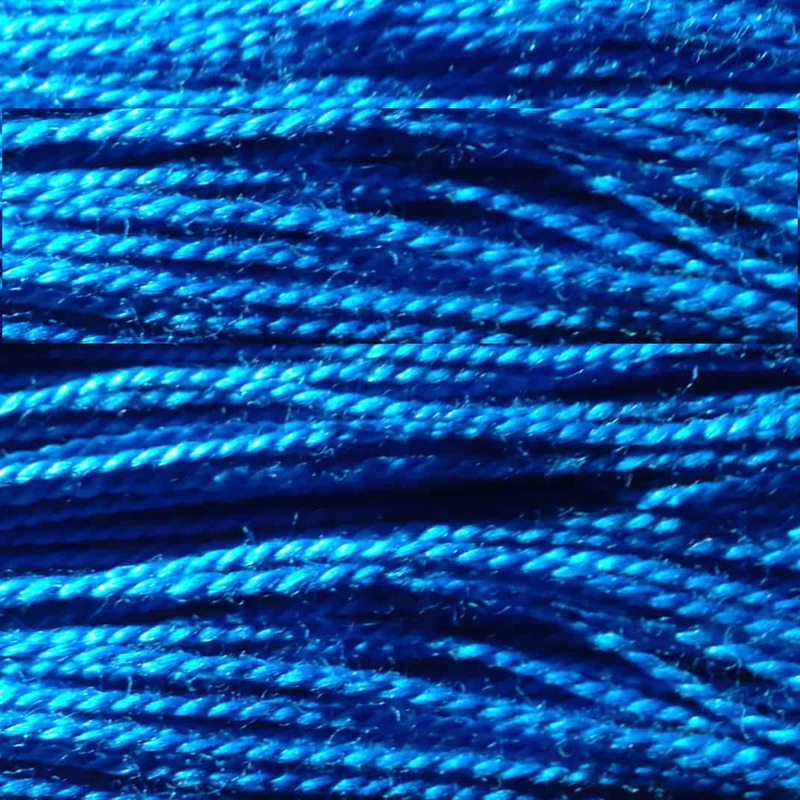 We’ve needed this color for quite a while; a generous and lively blue, not as dark as Lazurite or as attention-grabbing as Aquamarine, it’s a beautiful and compelling BLUE that sings when knit up with any of our other colors! I hope you enjoy knitting with the semi-solids as much as I do. Solids are a simple pleasure, perhaps not as showy or vibrantly exciting as a variegated block, blend or FLOW, but semi-solids are still very satisfying. 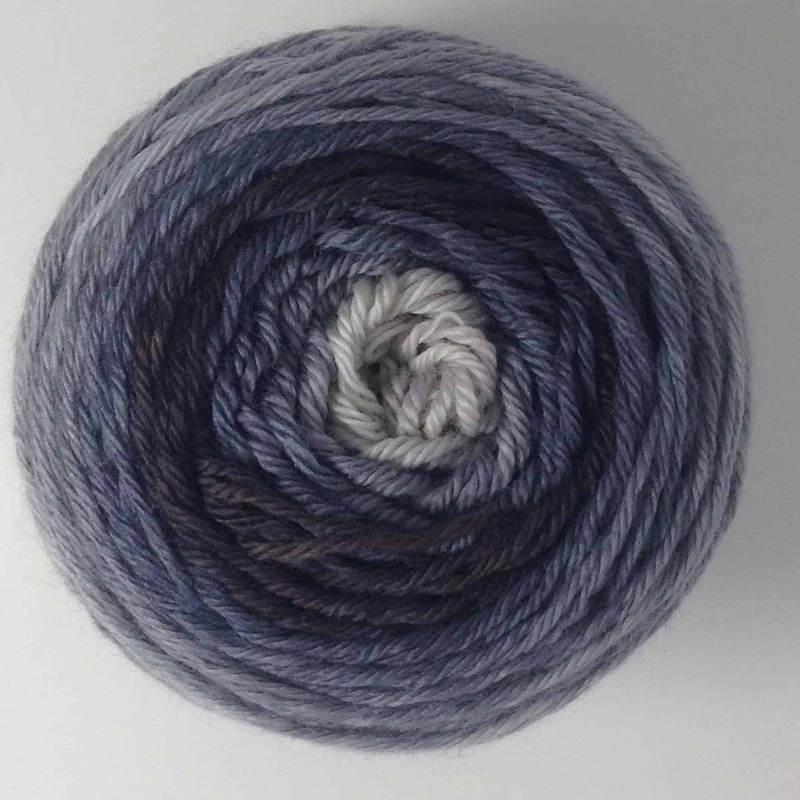 We’d love to give a skein of one of our Semi-Solid colors (in ModeWerk Worsted) to a lucky customer! Just leave a comment telling us what your favorite color was in the 3rd grade, and what it is now. I always find it interesting to see how our color favs change (or don’t) as we grow from childhood to adulthood! 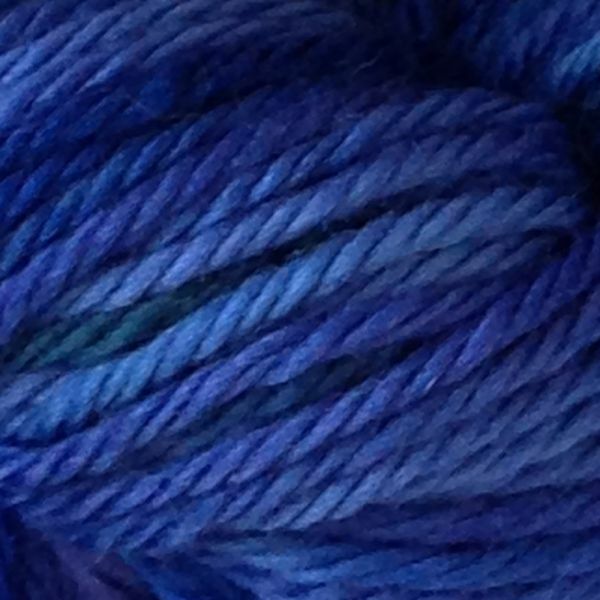 We’ll pick one commenter at random, contact the winner and ask what color they’d like, and send the skein off! This contest closes Friday, Mar 20 at 5pm Central Time. GOOD LUCK! ALL of our beautiful Semi Solid Colors! A creamy, deep white with warmth in the light and coolness when paired with a darker color. This is the definitive neutral, a necessity! Touches of warm yellow on a dark yellow base, a lovely contrast when used with more active colorways. A steady, lovely, glowing grey which can stand on it’s own, or just ‘be there’ for any other color you choose! With Pewter you get contrast, but with a milder bite than Coal. 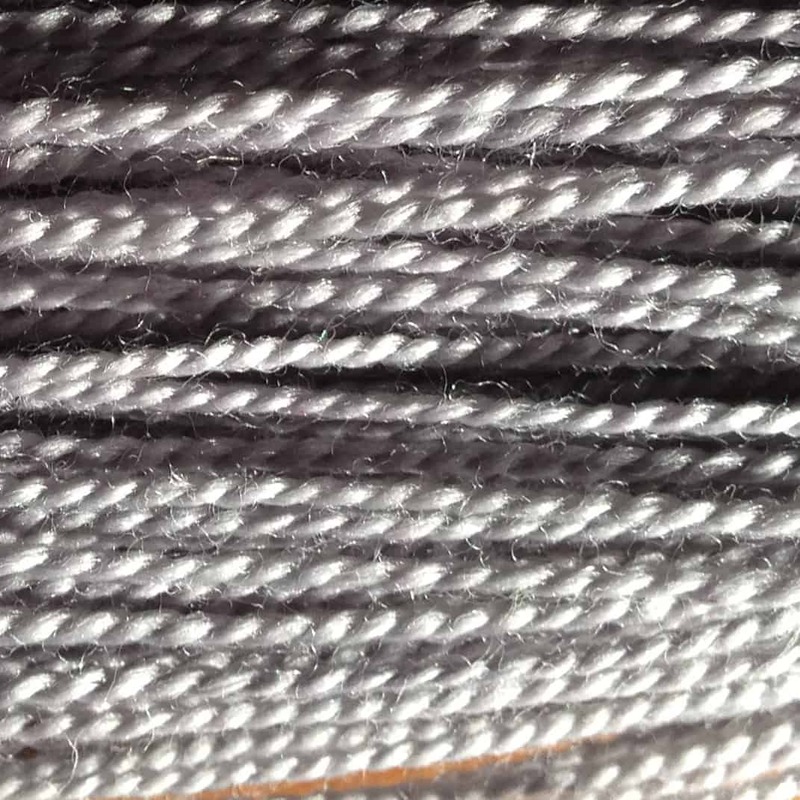 This blocky marriage of medium and dark greys will pair beautifully with any of our other yarns. Not just black, but a combination of colors overdyed with the darkest grey to create layers of black with unusual glints of lighter grey. The city, the isle, Emerald has always been the signature shade of the color green – and here’s our take on this exquisite hue! Deep green and brighter touches of light create the creamy beauty of natural jade in this semi-solid yarn. A lovely warm light-olive green. This is the Fifth of our six TARDIS Call Box Blue gradient, and we think it’s the coolest. Just like fezzes and bow ties. There’s nothing sea-foamy about our Aquamarine! This is the color of the beautiful Mediterranean, but from 5 feet down! Light is barely visible, just enough to make the bluish-green glow! The color of the sky in October is like no other sky of the year. The blue moves from an almost green-yellow at the horizon, through a rich, dark blue, ending with a touch of purple at the top of the sky. A generous and lively blue, not as dark as Lazurite or as attention-grabbing as Aquamarine, it’s a beautiful and compelling BLUE that sings when knit up with any of our other colors! The lightest of pure pinks, this semi solid will work beautifully with many of our Freckled and Flow colors, a new neutral! The rich, glowing purple of Amethyst hovers between a cool blue and a firery red, making it one of the most universally loved colors. One of the constants of A Song of Ice And Fire is the sheer wealth of the Lannister family. Clever and powerful, House Lannister’s words are “Hear Me Roar!” but unofficially their motto is “A Lannister always pays his debts.” They have the means and will power to pay any debt in full. Oh my, 3rd grade was SO long ago. I will say that it was probably purple, but now it’s blue (which purple is a from of so I really haven’t changed all that much). Oh my, 3rd grade was SO long ago. I will say that it was probably purple, but now it’s blue (which purple is a from of so I really haven’t changed all that much). What I really love are purple/blue combos! Blue then/shades of blue now. In third grade my favorite color was electric blue, the color you see when you look straight up on a summer day, very similar to the sapphire pictured above. Today, I’ve morphed into a big teal fan. Third grade?! I don’t think I can remember that far back, but my favorite color was probably blue. These days my favorite is just about anything in the purple family–lavendar, violet, amethyst. Your amethyst is lovely, but then all your colors are! In third grade I was a pink lover. Now I love purple. Not much of a change! Third grade: Emerald green. Now: Almost any shade of green except maybe chartreuse. Issue: I don’t look terrific in green because my eyes, which are sort of green, fade into nothing flavor when I wear green. I look much better in navy blue or something like the new Sapphire color. Skin looks good and eyes look quite green. But I still prefer emerald green. And I have multiple green shawls, cowls, scarves. If I want to knit blues, DH loves blue. He has a multi-blue scarf and a blue hat and unfortunately lost the blue scarf from a Brooklyn Tweed pattern in BFL yarn that is no longer available. So enough on colors from here. In 3rd grade I loved yellow. Favorite color in 3rd grade? Over half a century ago? I’ll take a stab with my favorite inert changeable, circular needles and say blue. Sapphire is my birthstone, after all. As for favorite color now, the turquoise family always makes me me happy. I was pretty much like every other little girl… Purple was my absolute favorite! Now I’ve moved on to green… Green… green… green! In 3rd grade I am pretty sure my favorite color was blue. I have been fairly consistent with that choice of blue. As a matter of fact, my favorite gemstones are sapphires and diamonds! 3rd grade – red! I had a red and white dress that I wore out by wearing it as often as I was permitted to do so. Now – green. Complementary colors, so perhaps not remarkable. I was constantly drawing with a pencil at that time. I cannot remember having a favorite color, but I know that I hated pink. My grandmother constantly tried to make me wear pink. I hated it. Now I love the blue-green hues. Teals, aquamarine, sea blues, turquoise- I especially love the color of greenish blue you find in some seawater. Don’t remember having a favorite because I was entranced by all of the colors in that Crayola box. Now it’s any shade of green. Hmmm…3rd grade? It might have been pink, but then again, it might have been “rainbow.” I went through a HUGE rainbow obsession for years. I corrected people if they didn’t get the colors in the right order…you get the idea. I was obnoxious! LOL. In third grade I loved purple. I would have told you Amethyst, because I was *that* kid. Today, I love purple, and blue and green. Kind of a three way tie. Oh I adored blue, blue, blue as a third grader…and I still do. But now I like to add a dash of green to it. give me teal and I’ll be happy, but give me all the blues and greens together and I’m ecstatic! My family moved to the Seattle area when I was 5, and somewhere along the line (by third grade, surely) I decided green needed to be my favorite color, because there was so much of it all around!! That’s still officially my favorite color, and I DO like it (although there really isn’t a color I DON’T like). However, my yarn and clothing purchases lead me to believe that my favorite color may actually be in the neighborhood of magenta/purple, LOL! My favorite color has always been blue. In third grade my favorite color was blue. We had just moved into our first house and I asked to have my room be blue. Now my favorite color is purple with red a close second. In third grade I loved purple. Now it’s blue. Red has consistently been my favorite color although I have added the green family of colors as I look at yarn purchases for the past few years. Probably my favorite in 3rd grade was blue. I love blue/green shades even now! My favorite color in 3rd grade was blue. While I still like blue, lately I have been leaning more & more towards green. I was so sure I answered this days ago . . . My favorite color as a child was blue. It still is blue but then I liked a darker, not quite navy blue and a pure blue. Now I lean towards a bit brighter and a bit more on the turquoise side of blue. A really big change . . . .
My mother made all our clothes. At Northwest Fabrics, I remember her asking what colors I wanted. There was a blue and maroon plaid that I wanted. She made me a skirt out of it. It was my all-time favorite. Today, my favorite is a deep red, Your ‘garnet’ is luscious!! My two favorite colors have bounced back and forth between shades of purple and blue since forever. I was definitely into purple then and am into deep, dark blues right now. But then again, I love all colors except pale yellow. Ick. Third grade? When you’re older than dirt, that’s a long time ago!! But I’m pretty sure it was an emerald green. Nowadays it’s purple, from warm reddish to cool bluish – helps prevent my skin from looking jaundiced!!! Then, definitely Purple. I loved ALL THE PURPLE! Now, greens. In third grade I was a purple girl. The I went blue for a long time. Now I am back to purple. Blue got boring! Third grade? hmmm I think green was my favortie color.. now I like that aquamarine color it’s beautiful!! Blue then, deep crimson now – does that mean I’ve grown up to be dangerous? Previous PostPrevious The ModeWerk FLOW Yarn Club! Next PostNext And we have a winner!